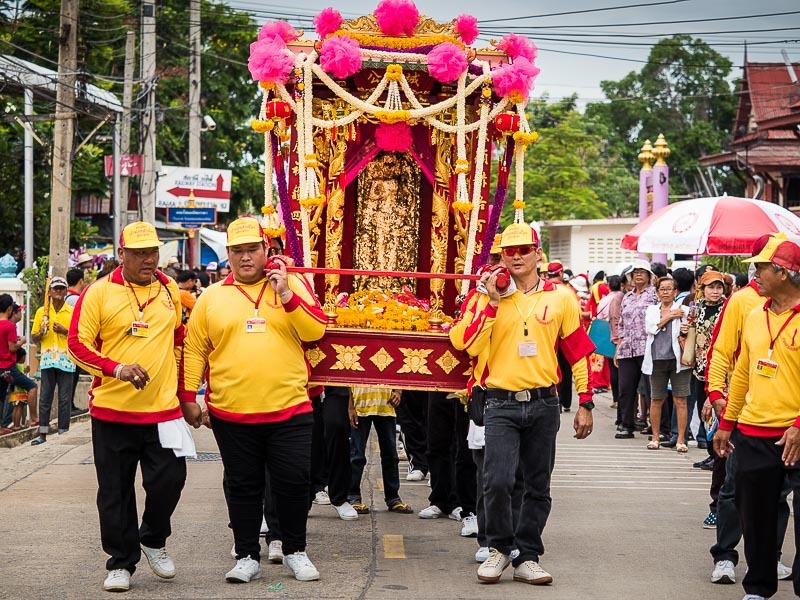 Men carry the Lak Mueang through Mahachai (Samut Sakhon). 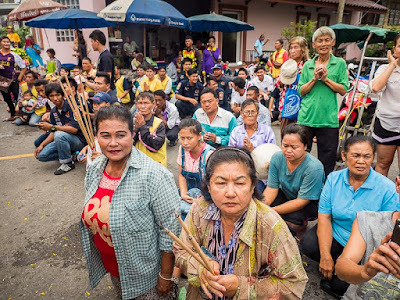 I went to Mahachai to photograph the procession for the City Pillar Shrine. 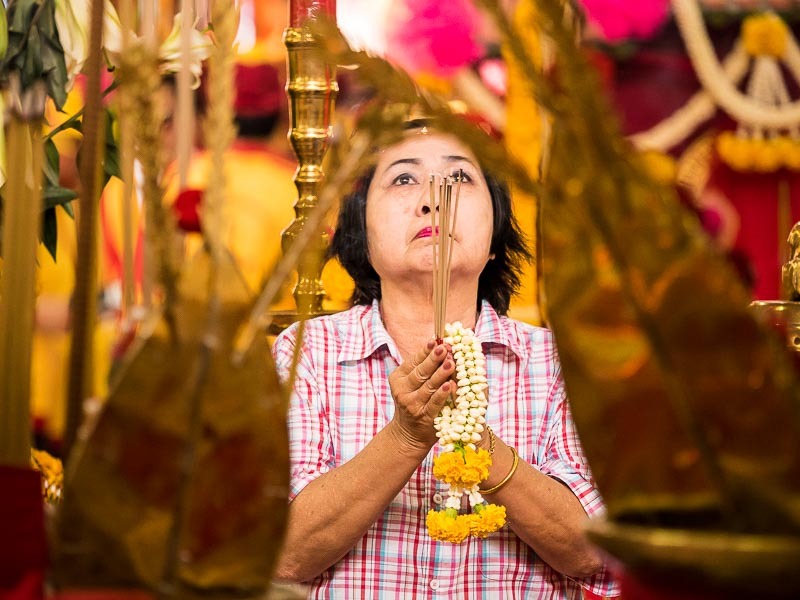 Most provincial capitals in Thailand have a City Pillar Shrine, called Lak Mueang. The shrines are revered by the city's residents and thought to offer protection to the city. City Pillar Shrines are a relatively new tradition in Thailand. King Rama I, the first King of the current Chakri Dynasty, ordered construction of the first City Pillar in Bangkok, across the street from the Grand Palace, in 1782. But it wasn't until 1992 that the Ministry of the Interior ordered the construction of shrines in all provincial capitals. A woman prays in the shrine in Mahachai. The festival honoring the City Pillar Shrine in Mahachai is one of the biggest public events of the year in the fishing port. The shrine is carried by a team of men to a waiting fishing boat and taken up the Tha Chin then paraded through the town and brought back to the temple. People pray as the shrine is carried past them. There's a three day festival in the park next to the temple with stages (for Chinese Operas and Likay), music acts perform each night and it's generally a good time. People get off the fishing boats that accompanied the shrine. 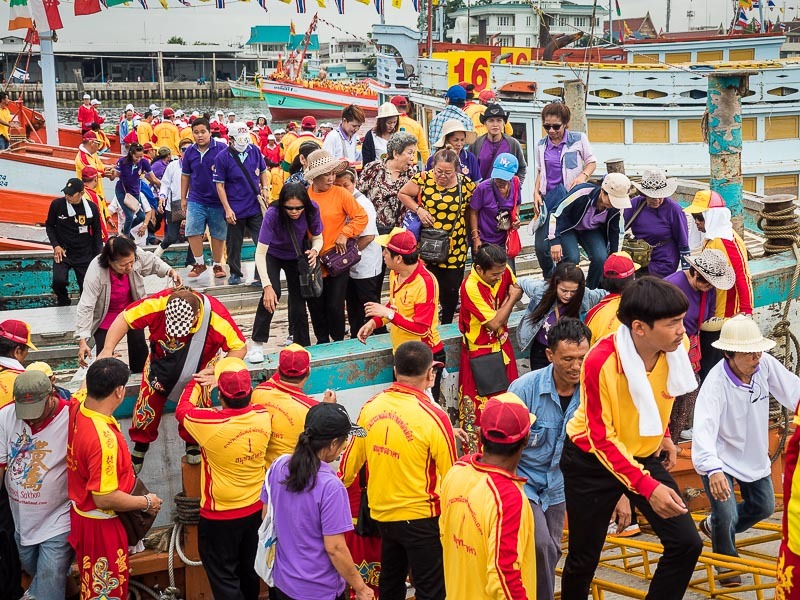 Hundreds of people jam onto fishing boats to participate in the shrine's procession on the river. 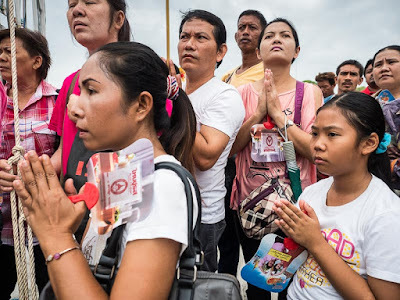 They walk ahead of the shrine as it's paraded through town, while people who didn't get on the boats line the streets to offer prayers and alms. People line the street to pray as the shrine passes them. 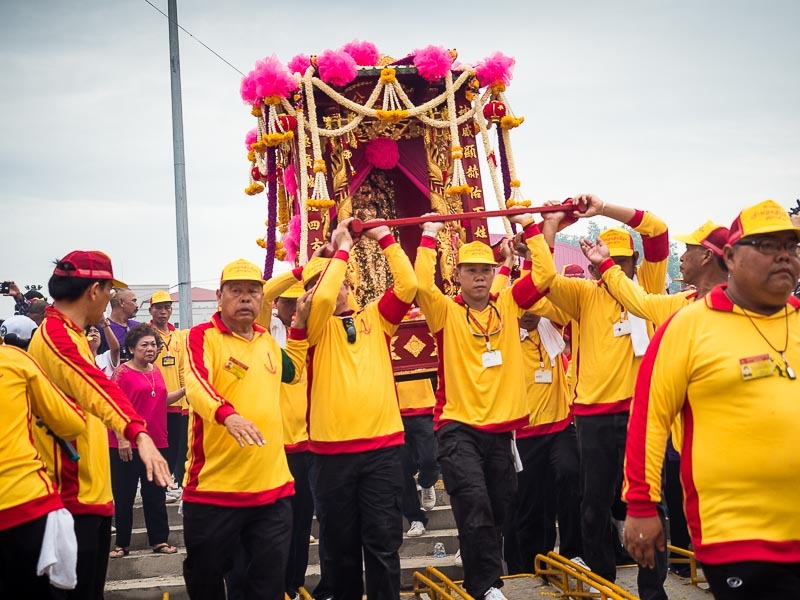 The shrine being carried through the streets. A school girl, in her uniform, prays as the shrine approaches her school. I covered the parade then returned to Bangkok. I've spent a lot of time in and around Mahachai. It's near the salt fields I photograph every year and thousands of Burmese migrant workers live in the town. They're the muscle that powers the town's fishing industry. This is the first time I've been there to cover a cultural event and I had a wonderful time. It's easy to get to Mahachai from Bangkok. A train leaves every hour from Wong Wian Yai train station in Thonburi and goes straight to Mahachai. Wong Wian Yai station is about a kilometer from the Wong Wian Yai BTS stop. 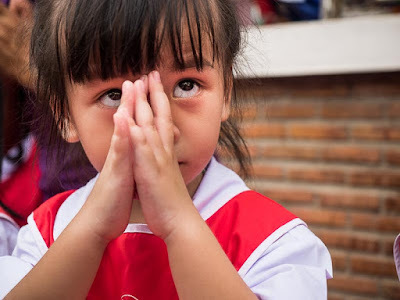 If I make the right BTS connections, I can be in Mahachai about 90 minutes after leaving my apartment. 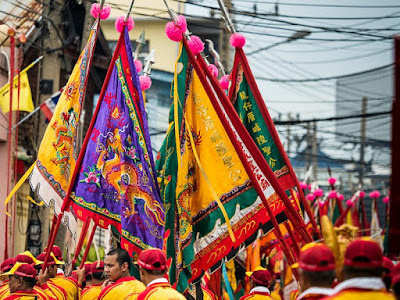 Prayer flags carried through Mahachai during the procession. There are more photos from the City Pillar Shrine procession in my archive or available from ZUMA Press.